VFL: Round 17 win in 60 seconds Get a snapshot of the VFL Magpies' 68-point win over the Northern Blues in 60 seconds with Collingwood Media. Jesse White and Patrick Karnezis have led the VFL Magpies to a 68-point victory over the Northern Blues in Saturday’s MCG curtain raiser. While Collingwood’s AFL side prepared to keep its season alive, the clubs VFL contingent set the tone with a convincing four-quarter performance. “To play before the arch rivals of Carlton, to play before the AFL boys – it was good,” VFL coach Dale Tapping told Collingwood Media post match. “The atmosphere is so much bigger… After quarter time we were really sharp with our defence. We created some turnovers and we always knew we could score and create on the back of that,” Tapping said. While a number of VFL Magpies covered the MCG turf for the first time, it was the experienced heads who prevailed in the first half. White returned to his best, attacking the ball convincingly in a matchup with Carlton-listed Liam Jones. White assisted in Collingwood’s first two goals of the match before kicking three of his own before the half time siren and another in the third quarter. Tapping believed White showed enough promise not only to lead the VFL team to victory, but to get back into the AFL mix. “He was really good today. He had a lot of energy,” Tapping said. “When you have a guy like that playing good footy in VFL level, if he’s launching at the ball, it’s going to set a pretty good standard for the day. With the competition celebrating multicultural round, American recruit Mason Cox and Collingwood’s multicultural ambassador Karnezis led the Magpies onto the ground and participated in the coin toss prior to the opening bounce. Both stayed in the limelight for the entirety of the game, with Karnezis kicking three goals from a position in the midfield, while Cox added two majors playing in the forward line. In response to his AFL omission, Jarrod Witts rucked convincingly and was named in the best, while Ben Kennedy once again displayed his VFL dominance with a best-on-ground performance. With the exception of emotion spilling over in a third quarter melee, the second half remained largely uneventful as Collingwood build a comprehensive advantage. After a seven goal quarter in the first term, the Magpies added another seven majors in the third quarter to open up a 66-point three-quarter-time lead. With a 1:45pm AFL start quickly approaching, the MCG stands begun to fill as the Magpies put the finishing touches on a percentage-boosting victory. 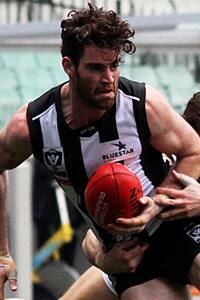 The final quarter was cut short at 22 minutes, with Collingwood walking away 68-point victors. The confidence filling win positions the VFL Magpies in good stead ahead of a trio of games at Victoria Park to round out the VFL season. The side will meet North Ballarat at 1pm next Saturday.